FILE - A general view of Muscat, Oman, Sept. 15, 2010. The Taliban’s stance of not engaging in peace talks with the current Afghan government “remains unchanged" and the insurgent group has “nothing to do” with next week’s four-nation dialogue in Oman aimed at seeking a politically negotiated end to the war, a senior insurgent official said Tuesday. Negotiators from Afghanistan, Pakistan, China and the United States are scheduled to meet in the Gulf state on October 16 to revive discussions on encouraging the Taliban to come to the negotiating table and enhance regional anti-terrorism cooperation. 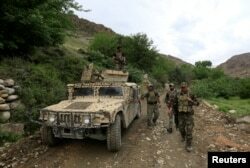 “Nobody has contacted us, nor are we participating in this meeting,” a senior Taliban official told VOA when asked whether the Islamist insurgency intends to join or approve the so-called Quadrilateral Cooperation Group, or QCG. He requested anonymity as he was not authorized to publicly discuss Taliban political matters. FILE - Delegations from Afghanistan, Pakistan, the United States and China discuss a road map for ending the war with the Taliban at the Presidential Palace in Kabul, Afghanistan, Feb. 23, 2016. “Our stance on talks with the Kabul government remains unchanged. We have nothing to do with this meeting. It is their [member nations] own affair,” the official said. The Taliban has long refused to engage in any Afghan peace talks until U.S. and NATO forces completely withdraw from Afghanistan. The insurgents have also been calling for, among other demands, recognition for their so-called political office in Qatar. The QCG was launched in January 2016, but the peace process broke down after a fifth session in May of that year, when a U.S. drone attack killed the leader of the Taliban, Mullah Akhtar Mansoor, while he was traveling through the Pakistani province of Baluchistan. FILE - Pakistani local residents gather around a burning vehicle hit by a U.S. drone strike, May 21, 2016. Afghan Taliban Mullah Akhtar Mansoor was the target of the drone near Dalbandin, Baluchistan, Pakistan. QCG members were supposed to use their respective influence on parties to the Afghan conflict to nudge the Taliban to the negotiating table; however, the Taliban’s reluctance to engage in peace talks, along with Kabul-Islamabad relations marred by mistrust, have been blamed for preventing any progress in previous QCG sessions. Pakistan Foreign Ministry spokesman Nafees Zakaria says that as a member of QCG, his country has always played the role of a facilitator along with China and the U.S to promote Afghan peace and reconciliation. "Pakistan supports negotiated settlement of issues and national reconciliation in Afghanistan. We do not believe that military approach can bring peace in Afghanistan," he told VOA when asked about Islamabad's expectations from the upcoming QCG meeting. Pakistani officials blamed Washington for scuttling the four-way process by eliminating Mansoor. Afghan and U.S. officials have long complained the Taliban uses sanctuaries on Pakistani soil to orchestrate insurgent attacks on the other side of the border. The QCG process is being revived at a time when the U.S. military has stepped up counter-Taliban operations in Afghanistan in a bid to halt resurgent Taliban advances and pressure them to engage in peace talks. FILE - Afghan Special Forces patrol at the site of a MOAB, or ''mother of all bombs,' which struck the Achin district of the eastern province of Nangarhar, Afghanistan, April 23, 2017. The latest official data shows U.S. forces dropped 751 bombs in September against the Taliban and militants linked to the Afghan branch of the Islamic State terrorist group, the largest number of weapons employed in a single month since 2012. “This increase can be attributed to the president’s strategy to more proactively target extremist groups that threaten the stability and security of the Afghan people,” according to a U.S. airpower monthly summary. In August, U.S. President Donald Trump announced his “new strategy” for the Afghan war, America’s longest overseas military engagement, promising intensification in military efforts and asking Pakistan to end “safe havens” on its territory. Islamabad rejected the charges as an attempt to “scapegoat” Pakistan for U.S. failures in Afghanistan. Skeptics are unsure whether the latest QCG process will produce results in the wake of growing contacts Russia and Iran have established with the Taliban. 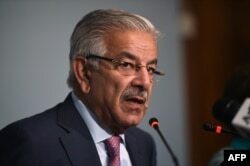 Pakistani Foreign Minister Khawaja Asif said last week that Moscow’s influence on the Taliban may have increased to the point that Moscow would be better able than Islamabad to coax the insurgents into peace talks. Pakistani Foreign Minister Khawaja Asif briefs the media at the end of a three-day conference in Islamabad, Pakistan, Sep. 7, 2017. "At least for our influence on Taliban today, there is a mistrust... perhaps they have more influence from other countries in that region than in our Pakistan," Asif told VOA when asked whether he was referring to Russia. 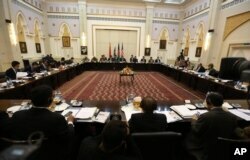 The Pakistani foreign minister, however, appeared upbeat about the coming QCG meeting in Oman’s capital, Muscat. ”The quadrilateral arrangement will again be in operation. So, that is something we still hope will... still work," Asif said. Islamabad, Moscow, Beijing and Tehran are pushing for a political solution to the Afghan war, saying 16-year of military efforts have failed to achieve peace in Afghanistan. Analysts like former U.S. special representative for Afghanistan and Pakistan, Richard Olson, at a recent public talk in Washington, also emphasized the need for making a political settlement with the Taliban a central element of the U.S. policy. “I would say that the first step in a modality, that is to say the first step in getting a peace process going, would be to... open formally the Taliban office in Doha for the purposes of discussing peace with the Afghan government in a publicly recognized way,” Olson said. The former U.S. envoy also noted that regional countries would have to be involved in Afghan peace building efforts because of an increase in the “hedging strategies” by countries around Afghanistan. “Russia and Iran have been building their relationships with the Taliban despite a lack of ideological religious affinity, especially on the part of Iran. Pakistan has never really abandoned a hedging strategy with regard to Afghanistan,” said Olson, who also served as Washington’s ambassador to Kabul and Islamabad.